HOME IS WHERE THE PIE IS Photograph by S.C., A.E.F. "Home is where the heart is" -- Thus the poet sang; But “home is where the pie is” For the doughboy gang. Crullers in the craters, Pastry in abris -- This Salvation Army lass Sure knows how to please! Watch her roll the pie crust Mellower than gold; Watch her place it neatly Within its ample mold; Sniff the grand aroma While it slowly bakes— Though the whine of "Minnie" shells Echoes far awakes. Tin hat for a halo! Ah, she wears it well! 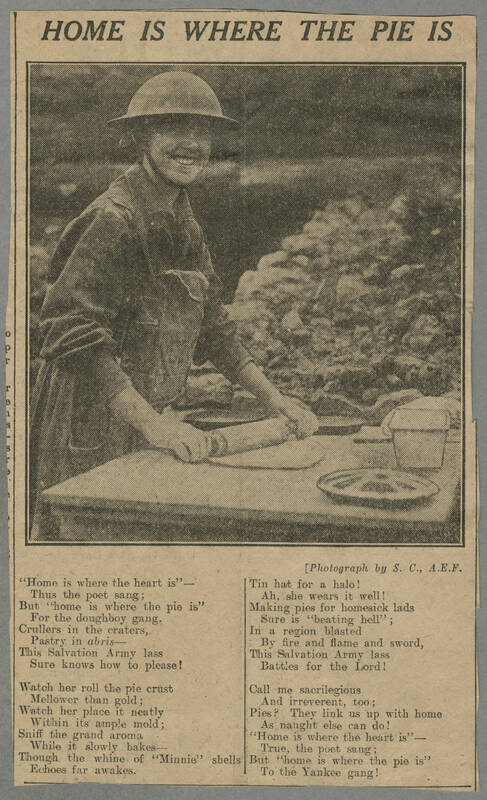 Making pies for homesick lads Sure is “beating hell”; In a region blasted By fire and flame and sword, This Salvation Army lass Battles for the Lord! Call me sacrilegious And irreverent, too; Pies? They link us up with home As naught else can do! “Home is where the heart is”— True, the poet sang; But “home is where the pie is” To the Yankee gang!